Oh man, it felt great to sleep in and wake up leisurely in my own hotel room. This is the third night this trail that I’ve had a room to myself and it was sooo relaxing and just what I needed to recharge. I lounged in bed and am caught up on all my trail chores and duties, so I got to get some things done that have been on the personal to do list for the last few months. With only a month left on trail, I have been thinking more of post trail life and getting things organized for when I get home. It was good to check a couple things off the list. I also watched a bit of Hulu and watched the series finale of Community. The new fall season of shows are something I’m definitely looking forward to in post trail life! I ate a ton this morning including an 880 calorie bean burrito from the lone convenience shop. I was sufficiently full when I left town, so that task was well accomplished too. There is a local that offers rides back to the pass for a price and we were all stubborn about paying. Kelly, a southbounder that came in with us, tried to hitch for 1.5hrs and had no luck. We convinced Richard who was offering the ride to come down to $10/person from $15 since there were six of us. We got to trail around 11:30am and Richard took a picture of all of us. Bloodbath, Rampage, Stopwatch, Optimist, Kelly(and Zoey) and me. We wished Kelly good luck going SOBO with her dog and headed on north. Bloodbath and Rampage had a fast pace going so I ended up sticking with Stopwatch and Optimist for the day. We have a mutual hiking friend and had heard of each other through him, so we were happy to have this day to overlap and get to know each other. Stopwatch and Optimist are hard working hikers who are getting their triple crown and started the trail a month after me. 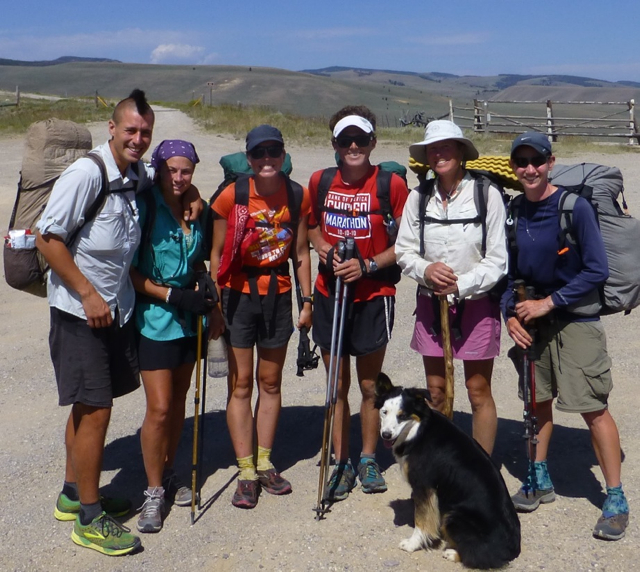 They are on a tighter schedule than me because they had to skip a Colorado section due to a fire and are going back to complete about two legs of trail after they hit the Canada border. Leadore was only their second sero all trail I think and they only took it because of the timing with the post office. They normally hike long days from 6am to 9pm, so this was our one day to overlap as I was willing to hike a bit later than usual since it was only a half day of hiking. We had a great time and talked pretty much the whole day. I can’t remember their website, but it is well followed and Stopwatch has written books about their PCT and AT that can be bought on Amazon. I’m sure their website will come up in a search if you google their trail names. 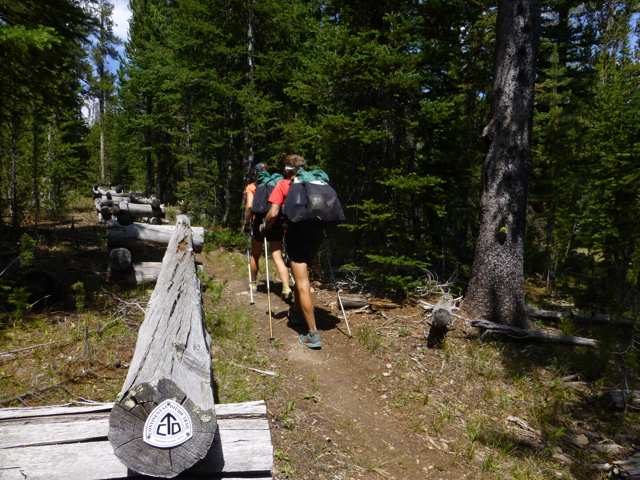 We hiked along the Divide and are still on the border of Montana and Idaho. 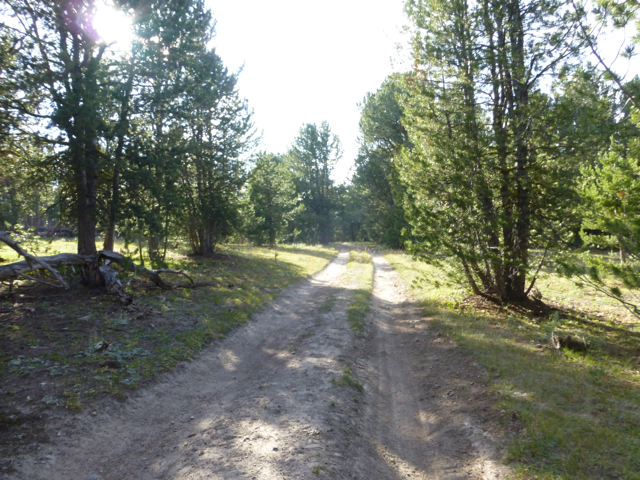 It was good hiking today with mostly trail or dirt road to follow. It was more wooded than it’s been and much less rolling hills, so that was nice. Nothing amazing as I only took three pictures all day. It was made entertaining and the day went by quickly with the conversation with Stopwatch and Optimist. Toward the end of the day, there was a note on trail from Bloodbath and Rampage indicating where they planned to camp and it ended up being further than I was willing to go. I need an extra hour at least each night to blog, so I hiked until 8:20pm and saw a good place to camp for the night. I said farewell to Stopwatch and Optimist who I may not see again. I forgot to get a campsite picture before dark and am nice and cozy. I might see Rampage and Bloodbath in the morning as I tend to get up earlier and they might be within two miles of me. It’s nice to get some time to myself though and would be fine if I ended up doing this leg just a few miles back from them and reuniting in town in a few more days.